The municipality of Nilüfer (339,667 inhabitants in 2012, 325,901 in the town proper; 49,575 ha) is located in the north-western part of the town of Bursa. 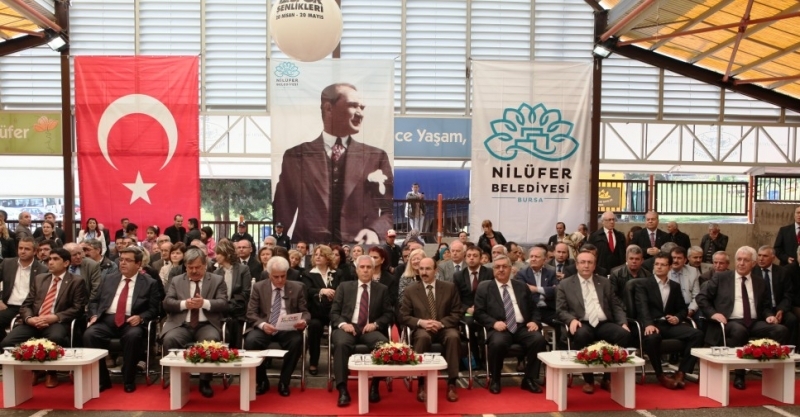 The flag of Nilüfer, used either horizontally (photo, photo) or vertically (photo), is white with the municipality's emblem in the middle. "Belediyesi" means "Municipality". The emblem of the municipality is canting, featuring a water lily, in Turkish, nilüfer. The Persian word niloufar also gave the Latin name of genius Nufar, and a generic name in some Latin languages (French: nénuphar / nénufar, Spanish: nenúfar, Catalan: "núfar"). The town of Nilüfer is named for the river that crosses it. Nilüfer Hatun (c. 1283 - c. 1383), the wife of the 2nd Ottoman Sultan, Ohran, and the mother of the 3rd Ottoman Sultan, had a bridge built across the river, soon known as Bridge and River Nilüfer, respectively. The bridge was made of cut sandstone and bricks. Previously it was formed of four lancet arches, but as the watercourse was filled, belatedly four small brick arches were added. The former flag of Nilüfer was white with the municipality's emblem in the middle. "Belediyesi" means "Municipality".